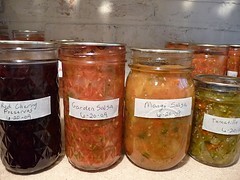 DetroitKnitter: Mango, Garden and Tomatillo Salsa - Cherry Preserves too! Mango, Garden and Tomatillo Salsa - Cherry Preserves too! When Dave announced that he bought some salsa from the store because we were out I was desperate. There's no way my man is going to eat that when I make my own. I had stored tomatoes in the freezer from last years crop. I wasn't too sure how well the salsa would turn out with mostly frozen tomatoes, but I figured I'd give it a try. I had about 6 pounds of blanched, chopped and frozen Roma tomatoes and I bought 3 pounds from the store. I picked up 10 jalapenos, a couple red and green bell peppers, onion and cilantro from the fruit market. After doing some research about the heat factor of hot peppers I decided that I really needed to try habanera peppers, which I found at a Kroger outside the city. About half of these ingredients (plus a few other spices) would make up my "Garden Salsa" as I like to call it and with the other half I'd make up that Meijer purchased packet of "Mango Salsa" for which I bought some fresh mangos. I decided the Garden salsa should be hotter than the mango so I only used 1 habanera for the mango and 5 for the Garden style. I took 2 jars of each to a picnic recently and all four jars were slurped up in record time. I can say that the habanera was the perfect heat! They both turned out fantastic! According to the heat index for hot peppers that I was reading about I would have had to put like 50 jalapenos in the salsa to get the same effect as 5 habanera. I hope Kroger carries habanera year round! Each batch made a total of 88 oz or 11 cups, which was canned in a variety of size jars in the waterbath canner. I also had just about 1.5 pounds of frozen Tomatillos, so I made some Tomatillo salsa too. I only got 2 half-pint jars from that though. I haven't tried it yet. I did put a smidge of the habanera in there too. And what the heck since I'm canning I might as well make the mess worth it so I made up some Bing Cherry preserves for topping ice cream with. Yum!